Janet's trip to upstate S.C. and the mountains of North Carolina to find family roots inspires me to post on my recent pilgrimage back to the historic home of the McLeods ... for 800 years in a village called Dunvegan (population 250 people at the most and many more sheep) on the Isle of Skye off the western coast of Scotland. MacLeods also lived on the islands of Harris and Lewis but my family came from Skye. Leod Olafson was a Norseman, or Viking if you will. He was the son of Olaf the Black. Family legend has it that Leod was called Leod the Ugly, but we're not real sure of that. 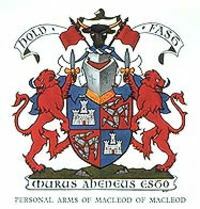 McLeod, which was originally MacLeod ... my surname ... means Son of Leod. 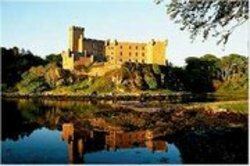 We are sure that Leod came over to the Inner Hebrides of Scotland in the 12th century, built a fort (which turned into a castle) at Dunvegan on the Isle of Skye, married into the local folks and became 1st cheiftain of the Clan MacLeod. The castle stands and the clan chieftain (Hugh MacLeod, 34) resides there. Here's Wikepedia's take on the Clan. The family knows that our first great-great-etc. grandfather in America was James McLeod of Isle of Skye who married Margaret Blakeley of County Down, Ireland, on Skye. They had a son, David, our great-etc. grandfather and then all three shipped to Charleston in 1773 (we don't know why; it was way after the Highland Clearances) and moved to Sumter County probably for cheap and available land. James died at 29 here in South Carolina so we wonder if he was killed in the Revolution. Like the McLeods of South Carolina, the MacLeods of Dunvegan Castle save pretty much everything down through the years. Relics include the Fairy Flag, given to the Clan by the fairies for strength in battle. It is silk from the Middle East (Syria or Rhodes) and dates to between the 4th and 7th centuries A.D., 400 years before the First Crusade. It might have been an early Christian robe or the war banner of Harold Hardrada, King of Norway, killed in 1066. I prefer to believe that it came from the ferries. There are also letters of thanks for the hospitality from Dr. Samuel Johnson and such after staying at Dunvegan Castle. There's a drinking cup made of a bull's horn and decorated in silverwork with the engraved date of 1493. There are a lot of portraits and books and there's a lock of Bonnie Prince Charlie's hair, a relic of the Jacobite uprising (or the '45, they call it in Scotland, as in 1745). Many MacLeods supported his attempt to regain the throne but the clan chieftains did not. I ran acrosss this dated post from July 2007 while searching the family history on google and felt compelled to respond. I'm not certain if we've met or if you know any of my family. My given name is William Rogers McLeod, Jr. I've met many other McLeod's through the years in SC, but don't recall meeting you and wanted to say hello. I have a 6 in metal bound book that details the family history if you're interested. My home email is mcleod@sc.rr.com. I look forward to hearing from you. morrisisle, hi! The castle in Dunvegan on Skye has changed over the centuries, but not on the outside! It's still stone set on a rocky place.